[PLAY FORTNITE WITHOUT DISTURBING YOUR FAMILY ] Beside the tangle free benefit, you can also immerse into the Battle Royale without disturbing your friends or family. 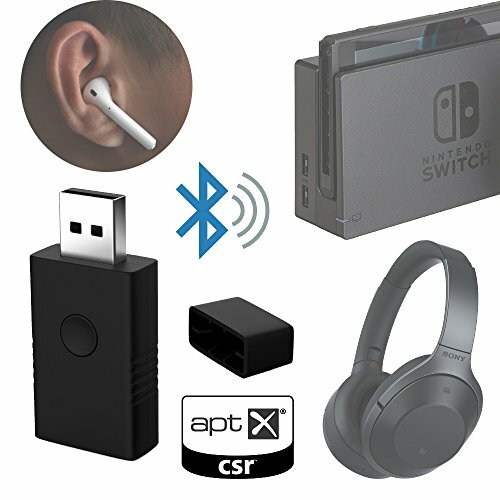 [FAST STREAM NO LIP-SYNC DELAY BY APTXLL LOW LATENCY]: Fully compatible with any Fast Stream low latency Bluetooth transmitter for a minimal audio delay of less than 40ms (undetectable by human ear) for a lag-free audio experience for TV PC Gaming and cell phones. [COMPATIBLE WITH NINTENDO SWITCH PS4 PC MAC SYSTEMS] One dongle for almost all systems.No Matter for gaming, work or life, Yoliq GameLink has you covered. [SLEEK DESIGN TO FIT YOUR LIFE STYLE] It is compact and easy to use. The rectangle design enable it fit your PS4 or Nintendo Switch perfectly. [NO BATTERY REQUIRED JUST PLUG IN AND ENJOY YOUR WIRELESS AUDIO] You don't need to charge it, just plug in and forget. The GameLink will connect with the last paired device automatically. If you have any questions about this product by Yoilq, contact us by completing and submitting the form below. If you are looking for a specif part number, please include it with your message.